Immaculate and Stunning Home Nestled in the Dove Mountain Area with incredible desert and Tortolita mountain range views! - Located in the gated community “The Preserve” you will find and experience the ultimate in luxury, serenity, relaxation and convenience. - The home is located on a corner lot with plenty of privacy and scenic panoramas. You will love staying in this beautiful 3 bedroom, 2 and a half bath home with 360-degree views of Southern Arizona’s unique, active and gorgeous Sonoran Desert. When driving through the neighborhood you will appreciate the lush natural floral and desert landscaping and territorial colors of the homes. The home itself features ample parking with a two-car immaculate garage with a new epoxy painted floor plus a two-car driveway. As you enter the home you will immediately notice the beautiful tile flooring that is throughout the entire home. To the right of the entryway you will find a large formal dining room with a warm, welcoming atmosphere and a custom carved large mirror and wood dining table with seating for eight. It is the perfect place to host a family or social gathering or to celebrate a special occasion. Located across from the formal dining area is a guest bath with a pedestal sink and a Toto smart, self-cleaning toilet. The Toto in this bath is an extra, hygienic luxury by inclusion of a remote controlled bidet. You will find the kitchen and living area which includes another dining table and chairs. The kitchen island hosts three bar stools. The open floor plan allows for maximum enjoyment of both spaces! The kitchen is fully equipped with everything needed to whip up a gourmet meal or some drinks to enjoy on the patio. It features several small appliances including a Toaster, a Nutra-Bullet, a Keurig Coffee Machine plus more! The kitchen also boasts upgraded cabinets, granite countertops, including a large central island and top of the line brand new appliances in a flat-brushed stainless steel finish. The fridge and freezer are side by side and allow for ample food storage. The Living Room features plenty of comfortable seating and an HD Smart television where you can watch cable, movies, or stream your Netflix or Amazon if you choose. The Television in the living area also features Apple TV, surround sound and the entire system for the television and stereo system can be controlled and operated from one easy to use touch screen remote. This remote can also be used to operate and control the entertainment system on the back patio, allowing for dual entertainment zones at once. To the left of the kitchen and living room you will find a short hall that has the entrance to the laundry room and garage on the left. The Laundry area also features brand new, top of the line appliances, a utility sink and plenty of storage space. Moving to the right of the laundry room and forward you will encounter the hallway containing the bedrooms. The first guest bedroom contains a large queen bed and sitting area with plenty of extra lighting by the bed for reading. The next doorway to the left takes you to the full bath. This bathroom features a tub/shower combination and extended vanity offering plenty of counter space in addition to the medicine cabinet and under vanity storage. Next you will encounter the second guest bedroom. This bedroom contains two twin beds and a seating area as well. There is also additional lighting in this room for reading and both guest bedrooms have large wall closets with double sliding doors. At the end of the hallway you will find the Master Bedroom and Bath. Large and spacious, it will be an absolute treat at the end of the day to sink into this well-appointed four-poster King sized bed, after enjoying a relaxing soak in the large garden tub in the master en-suite bath. The master bathroom also has a separate glass shower and huge walk in closet with plenty of built-ins and shelving. The master Suite also features two sitting areas and a large Television. The entire home is decorated with a prevailing “south seas, British West Indies" flair and blends beautifully with the warm tones of the desert while adding a flavor of the exotic! Colors pop in this home and it is tastefully decorated. This is especially true for the outdoor space! The backyard is completely paved with flagstone of varying colors, with the front half offering a large covered area to relax in the shade and enjoy an al fresco meal with three different dining/seating areas. If you would prefer to catch some sun and work on your tan there are several large loungers available throughout the patio. There is also a large gas grill with a complete set of grilling and BBQ tools, and as if this did not already set the stage for a perfect night of relaxing outdoors under our famous Tucson Sunsets, than you will certainly find the spa to be a satisfying grand finale! 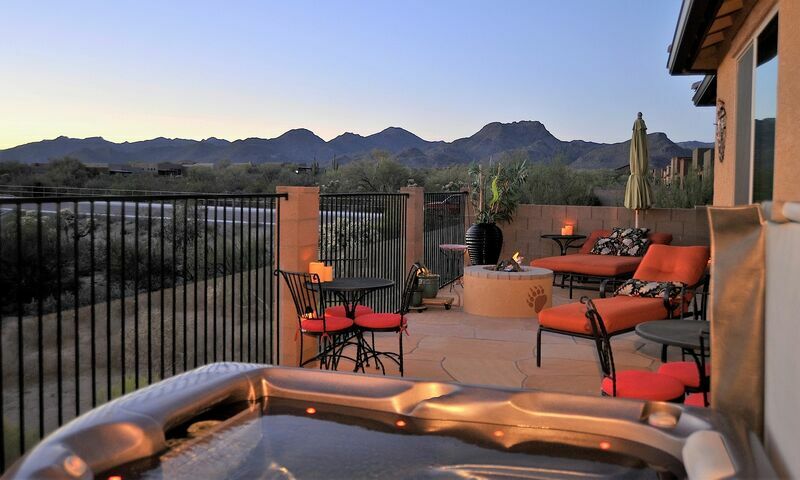 You will truly know you are on the best vacation once you are sitting in the hot tub taking in the views of Dove Mountain and the the Tortolitas. Choose the light setting of your choice to create the ultimate atmosphere of carefree enjoyment, and don’t forget to wind down afterwards with a nice sit by the gas fire pit. Within a couple of miles are both The Gallery and Dove Mountain Ritz-Carlton renowned golf courses and clubs. You are also just down the road from the new Simon's Outlet Mall. With so much to offer you will never want to go home and will find yourself coming back to this little slice of your personal Desert Paradise again and again!